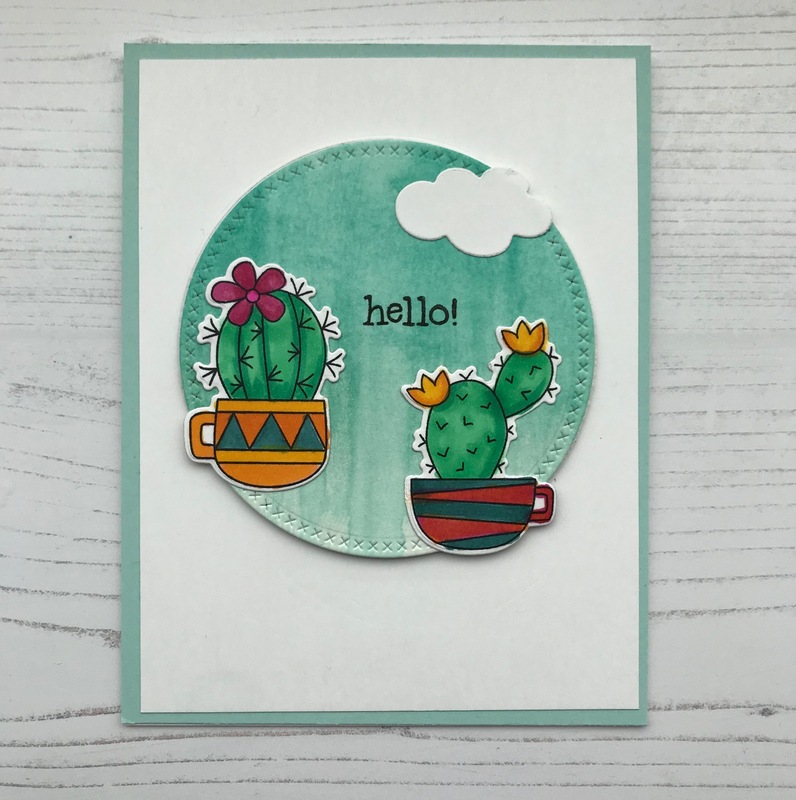 I just wanted to make a cute card from Newton’s Nook Cuppa Cactus stamp set. The shape of these cacti is just perfect for some Copic coloring and I like the fact that plants are sitting in patterned coffee mugs! I decide to use a circle die with cross-stitching around the edge to complement and emphasize the cactus spines. The circle was die-cut from a piece of watercolor cardstock that I had washed with aqua-colored ink. Using a flat brush, color-wash a piece of watercolor paper with diluted aqua colored ink. Let the paper dry. Die-cut a circle (about 3.25” in diameter) from the dried color-washed watercolor paper. Stamp the cacti images onto some white cardstock using a Copic-friendly ink. Die-cut the cacti images from their coordinating dies or fussy-cut them using scissors. Die-cut a small puffy cloud or cut a puffy cloud from white cardstock using scissors. Cut a 4-inch x 5.25-inch piece of white cardstock. 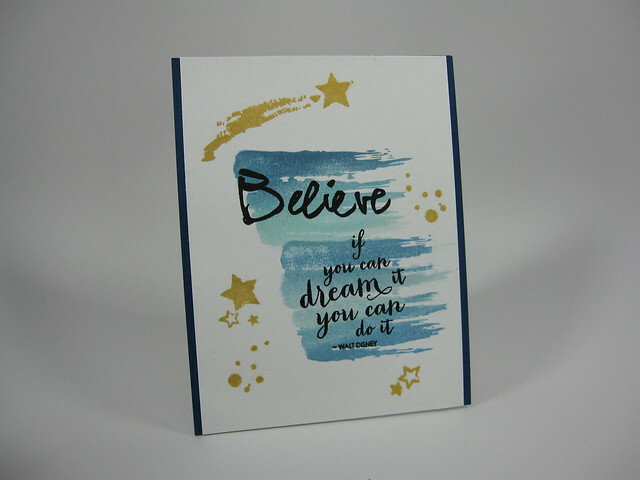 Adhere the 4-inch x 5.25-inch piece of white cardstock to the A2 piece of aqua-colored cardstock to make the card front. Adhere foam tape to the back of the color-washed circle. Adhere the color-washed circle to the card front and mount the cacti and clouds (all flush) onto the circle. 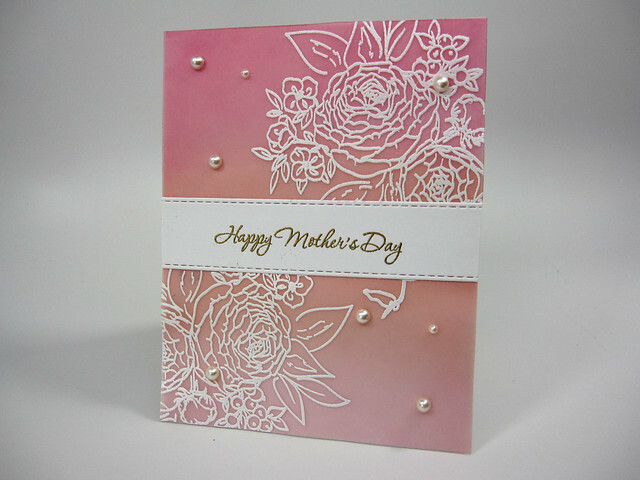 Mount the completed card front onto an A2 card base. Stamps: Newton’s Nook: Cuppa Cactus stamp set. Dies: Newton’s Nook: Cuppa Cactus coordinating die set; My Favorite Things: Cross-Stitch Circle Stax dies (second larges die in the set); WPlus9: Hearts & Clouds die set (no longer available). Inks: Papertrey Ink in Hawaiian Shores and Tropical Teal (blended for a light wash for the circle background); Versafine Pigment Ink in Onyx Black (sentiment). Copic Markers: Cacti: G14, G16; Flowers: RV19 and RV17 for one flower, Y19 and YR15 for the other flower; Coffee Mugs: BG18,YR15, YR65 for one mug, BG18, YR14 over YR19 for the other mug. Cardstock: Watercolor cardstock for circle background; Neenah Solar White 80# (for stamped cacti images and cloud); Papertrey Ink: Aqua Mist (for mat); Neenah Solar White 110# (for card base). Tropical temperatures and summer go hand in hand where I live. Currently, we are having a respite from the heat, but I’m sure the hot and humid weather will come back soon to Chicago. This card is bright and cheery and is meant to perk up anyone who is dealing with hot temperatures wherever they may live. 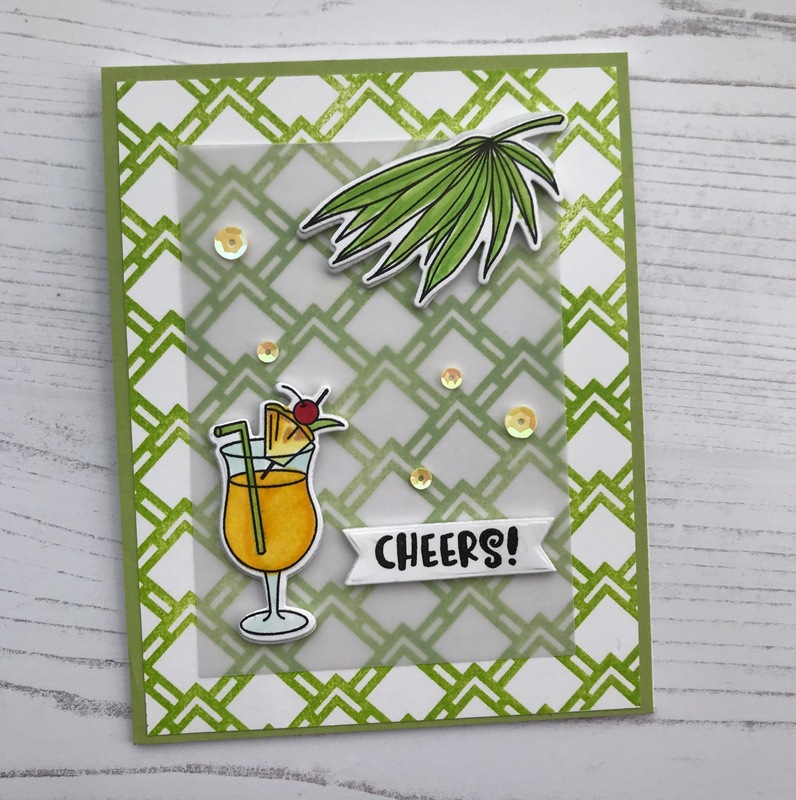 Stamp tropical flower and palm leaves images (twice for the large leaf image and once for the smaller leaf image for a total of 3 stamped leaf images) onto Neenah Solar White 80# cardstock using Memento Tuxedo Ink or any Copic-friendly ink. Color the images with Copic markers. Die-cut the images using their coordinating dies, or fussy cut them. Onto a 4” x 5.25” piece of Strathmore Bristol Smooth paper (140#), blend and fade yellow ink onto the lower left area of the paper and the upper right area. Use a foam blending tool for this. Arrange the leaf images behind the flower image. Tape the leaf images together. Adhere the flower image with foam tape onto the bed of leaves. Adhere the entire flower/leaves images to the Bristol Smooth paper. 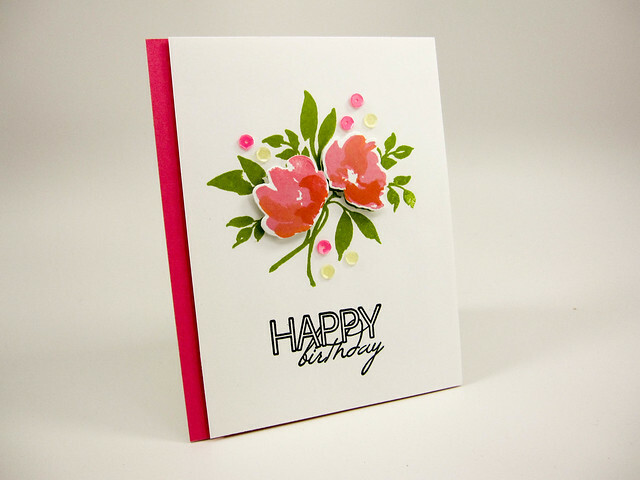 Stamp the sentiment in the upper-right area of the card front. Mount the card front onto an A2-sized green-colored mat. Mount the final card front onto an A2-sized card base. 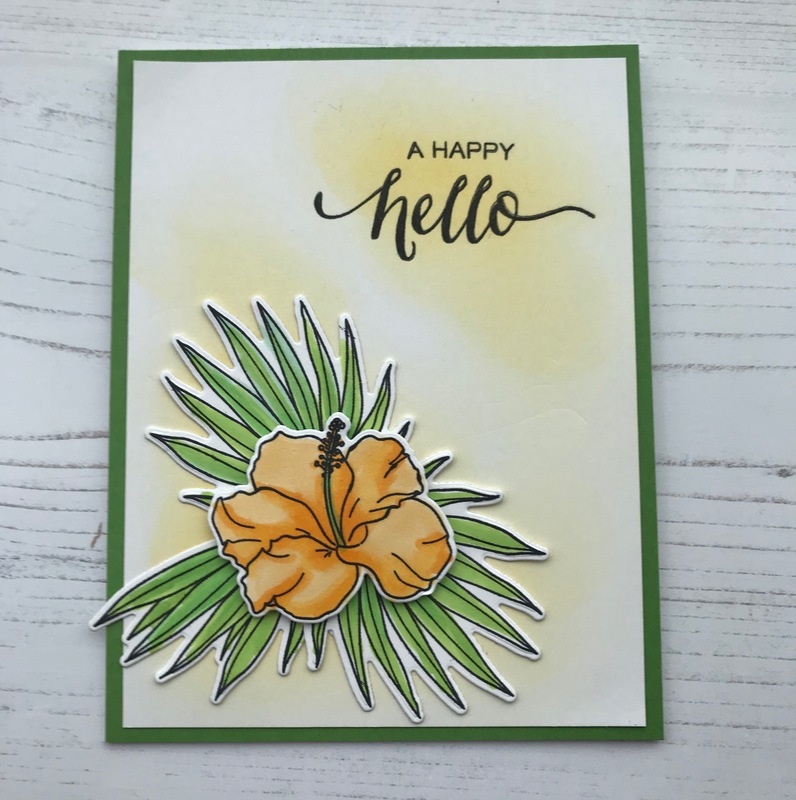 Stamps: WPlus9: Tropic Fever stamp set (tropical flower and large and smaller palm leaves); WPlus9: Hand-lettered Hello (sentiment). Dies: WPlus9: Tropic Fever coordinating die set. Cardstock: Strathmore: Bristol Smooth paper (140#); Neenah Solar White 80# cardstock (stamped images); Papertrey Ink: New Leaf cardstock (mat); Neenah Solar White 110# cardstock for card base. Copic Markers: Leaves: YG06, YG23; Flower: Y32, Y35, Y38. Hope you like this project. Have a great and cool day!